In Finland, seven non-profit “reuse centres” called Kierrätyskeskus have popped up. Would you shop in a second-hand supermarket? 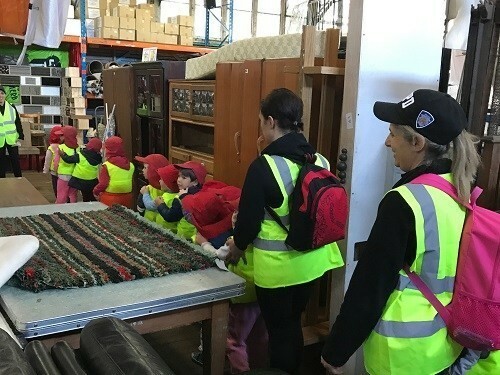 In Finland, seven non-profit “reuse centres” called Kierrätyskeskus have popped up around Helsinki, offering preloved furniture, clothes, toys, books, sports gear and cookware. Sounds like a giant thrift store? It’s more a way of life, promoting sustainable consumption while also selling second-hand craft supplies and what it calls “incredibly fabulous” upcycled furniture. And there’s an online shop that serves the whole nation as well as an environmental-education programme. While the stores aren’t new, they represent a growing awareness of how human life is putting pressure on the planet, and the need to cut down on consumption. With the global population forecast to grow to 9 billion by 2045, these ideas are gaining traction in many countries, with people and governments recognising the need to reduce their environmental impact and embrace a “circular economy” by reusing and recycling more. New Zealand is just one example, where the government is aiming to reduce waste with such an approach. And individual cities are also adopting the principles. While the ideas are sound, challenges remain, with initiatives like this dwarfed by the amount of trash generated every day and the proliferation of readily available cheap new products. Pressure group RREUSE estimates that 77% of European citizens would be willing to have their goods repaired, but hardly ever do, because they think it is too expensive. Such ideas and how to quicken the pace of change are explored in the World Economic Forum’s research on the circular economy, which estimates that embracing the idea represents a $4.5 trillion global growth opportunity by 2030. The Forum hosts and facilitates a public-private collaboration called PACE, the Platform for Accelerating the Circular Economy, launched in 2017. PACE explores ideas like how to reduce electronic waste, or e-waste, or recover more plastic waste. It estimates that in 2016, 44.7 million metric tonnes of e-waste was generated globally and that such rubbish contains high-value deposits including gold, silver, copper and platinum. The way forward will rely on the interaction between large corporations and policymakers. The Forum highlights several companies that are already embracing these ideas. Philips has a “lighting as a service” initiative, under which it retains ownership of the lighting equipment it supplies and can manage it from an environmental point of view at the end of its life. Vodafone offers a “trade in” service for old devices and retailer H&M collects old garments for reuse and recycling, allowing customers to swap end-of-use clothes for a voucher. At a national level, other initiatives are also making progress. Australia’s Reverse Garbage offers ethical shopping and education for people looking to to live more sustainably. And in the US, Ann Arbor in Michigan is one of several cities that has a reuse centre, which helped divert more than 1,200 tons from landfill in one month alone. Another initiative is the global Freecycle Network, which allows people to exchange items for free and has more than 9 million members. Back in Finland, the ReUse centres stock ecological craft supplies and offer workshops where customers can learn to make presents, jewellery and other items, giving old items a new lease of life.